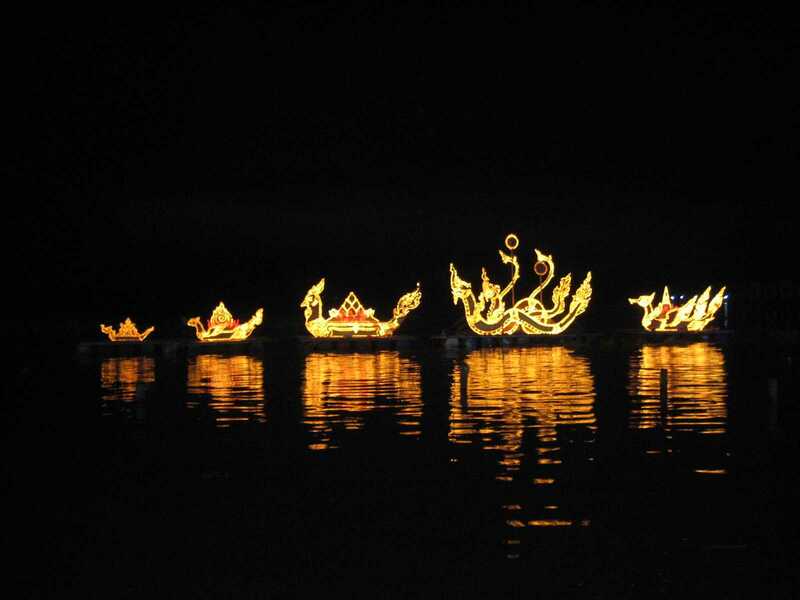 The word “Loy” means “to float”, and “Krathong” means lotus-shaped vessel made of banana leaves. Loy Krathong is, therefore the floating of an illuminated leaf bowl. But nowadays some krathongs are made of coloured paper. A krathong usually contains a candle, three joss sticks, some flowers and coins. The ceremony is believed to have originated in the time of King Ramkhamhaeng of Sukhothai, the first capital of Thailand, and to have been started by Nang Nophamas or Tao Sri Chulalak, the Brahman consort of the King. She was the first person who introduced “Krathongcherm”, the banana leaf krathong in the form of lotus blossom on the festival night. The festival starts in the evening when there is a full moon in the sky. People carry their krathongs to the river and canals. After lighting candles and joss sticks and making a wish, they gently place the krathongs on the water and let them drift away till they go out of sight. It is believed that krathongs carry away their sins and bad luck, and happiness will come to them. Indeed, it is the time to be joyful and happy as the sufferings are floated away. The festival includes a contest of Krathong-making, the Nophamas Queen Contest, local games and performances, entertainment programs and firework displays. The Loy Krathong song contributes to the romantic atmosphere of this occasion.